This two shelf corner bookcase is perfect for the home or office and is a great way to add a bit of extra storage to your office without taking up a large amount of space. The Mayline Medina Series bookcases work well when set up against storage cabinets, lateral files, or in corners of rooms. This bookcase has an Italian design inspired laminate finish, offering a luxurious appeal at an affordable price. Multiple colors available for this two shelf book case: Gray Steel, Mahogany, Mocha, Sea Salt, and Textured Brown Sugar. Designed with a 1" thick desk surface which seems to float on silver supports, the MND72 would make a great addition to any office. 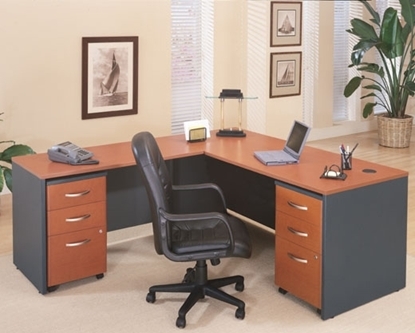 This desk includes a center drawer and a silver modesty panel. Perfect desk for a home office or small business. Plenty of work space for a laptop computer or desktop. Series C is one of Bush Furniture's longest standing lines featuring durable construction, efficient storage solutions, and PVC edge banding that stands up to collisions and dents. Free shipping and warranty available on all office furniture. Order now!